The Westminster Reference Bible from TBS is a new setting of the King James Version with some very impressive features. 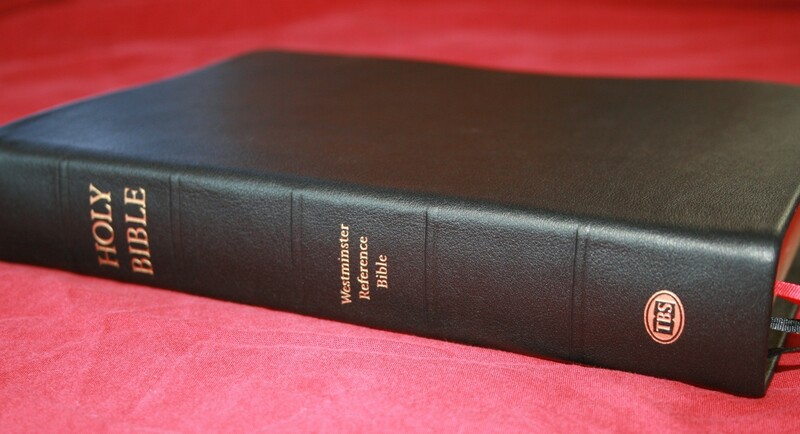 With 200,000 references, large font, marginal notes and definitions, and calfskin cover with sewn binding, and more, the Westminster Reference Bible is an amazing KJV at an amazing price. 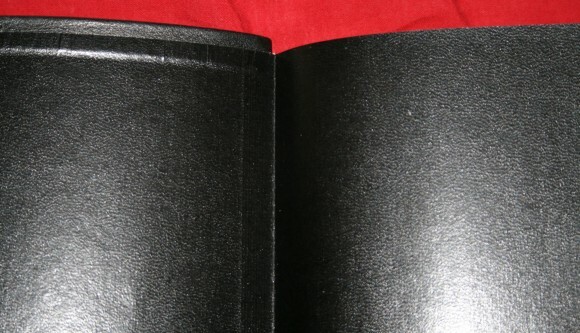 This edition is calfskin cover with a vinyl liner. The calfskin is smooth and has a soft feel, but it is also fairly stiff. It might soften up with use. I actually like it the way it is. Although it’s not very pronounced, it does have a grainy texture that looks and feels great. The binding is Smyth sewn. It has no problem lying flat in Genesis 1. The paper is thin and has a nice cream tint. This is my favorite shade for paper. A slight cream tint looks better to me and makes the page easier to read for extended periods of time. The opacity is decent. There are 32 blank pages in the back for writing. They are the same paper as the rest of the text. Good writing paper would be nice, but I’d rather have this paper than nothing. I really appreciate that it’s there. 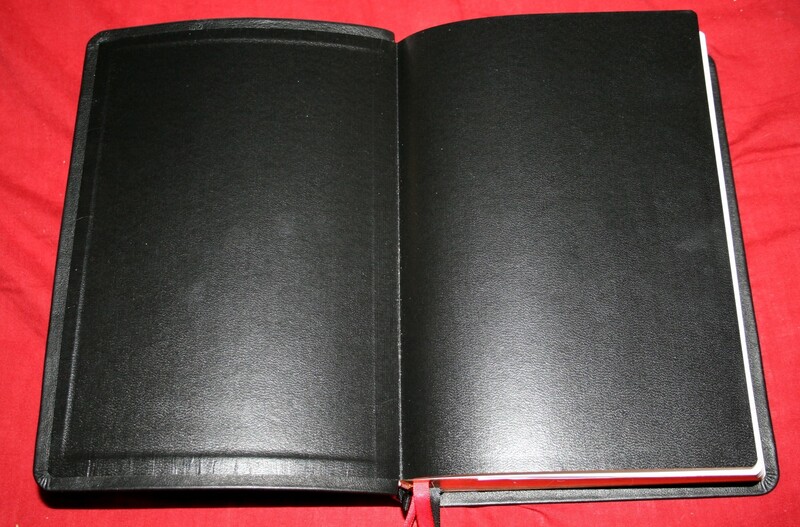 I’d like to see blank pages become the standard in Bible publishing. The font is 9.6 with a generous leading. The font is sharp and clean. The print has line-matching, so the lines on both sides of the page line up with each other. This greatly enhances readability. This is a black letter edition. It includes italics for supplied words and rather than being a self-pronouncing text, a pronunciation guide appears in the back. This has a two-column layout for the text with references on the outer and inner margins. The text is in verse-by-verse format. This is my favorite format for study and using in Church. At the top of each page is a title for that page (a one-line summary), the book name, and chapters that appear on that page. At the beginning of each chapter is a summary of that chapter. The chapter summaries are taken from the 1773 AV (KJV) printing by Eyre and Strahan. Obsolete words that do not appear in the text have been replaced with modern words or words found in the text. The chapter summaries span the margin and the text, taking two columns. They’re printed in italics and have the largest font size I’ve seen for chapter summaries. I’m guessing, but they look to be around 7-7.5. 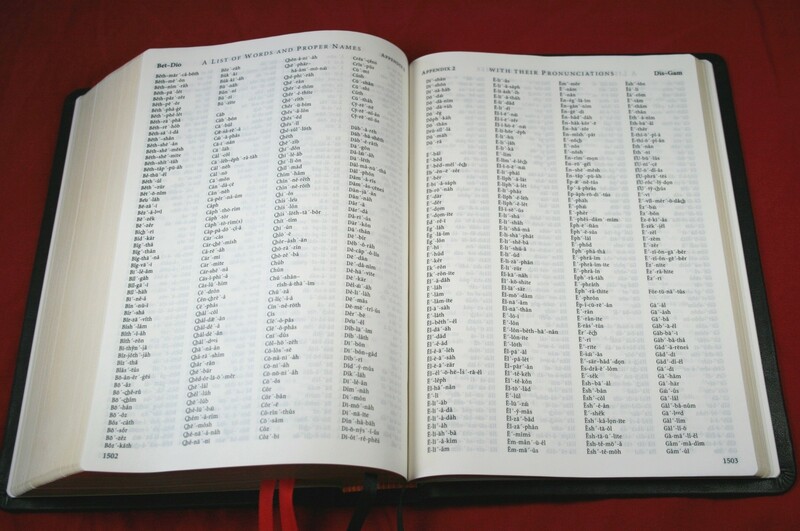 The 200,000 cross-references are the most I’ve ever seen in a Bible. They are a combination of John Brown’s Self Interpreting Bible published in 1778 and the references from the Concord. You can tell there are two sets of references because there is a string of references are in Biblical order followed by another string of references in Biblical order. The amount of references is massive, but they don’t always apply as perfectly as I would like. That’s better than having references left out. References are keyed to the text with letters and are located as close as possible to the verse they go with. The original translators’ notes on alternate Hebrew or Greek renderings are included in the margins. They are keyed to the text with numbers. Also in the margins are definitions of words that are no longer in use, words that have changed meaning, plants, animals, and objects. The definitions are keyed to the text with an asterisk. The asterisk also appears in the margin with the word and its definition. There are four ribbon markers in this edition (the hard cover editions have two). 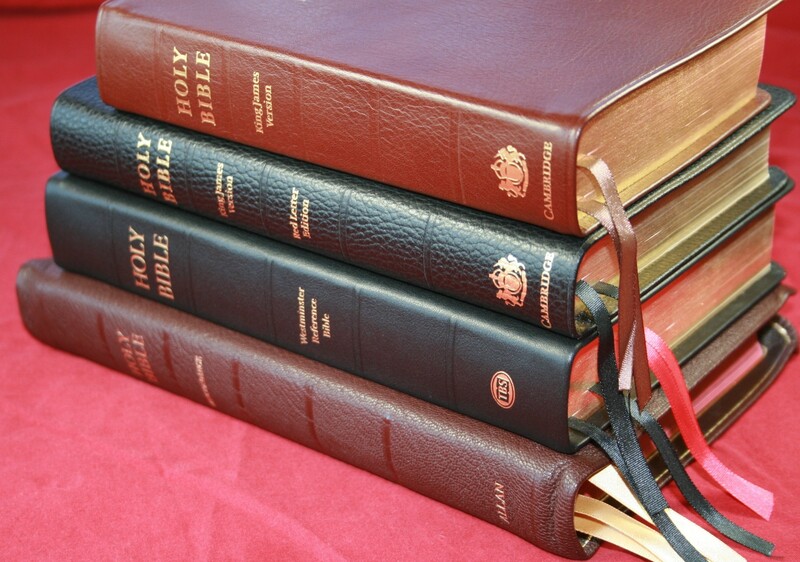 There are two red ribbons for the Old Testament and two black ribbons for the New Testament. They’re .25 inches wide. The gilting seems to flake off or smudge a little too easily. I placed my thumb on the edges and it left a small circle where my thumb was touching. Then I started noticing it in other places. It’s not bad by any means. It’s not even that noticeable, but it could become more noticeable over time. There are 5.25 pages of tables that describe weights and measure. The tables include Old Testament weights, lengths, liquid measures, dry measures, money, and time, and then the same tables for the New Testament. The tables include the type of measure, Hebrew or Greek words used, modern equivalents in US and British amounts, and Biblical references where the measures are used. The text is keyed to the tables by a symbol. The same symbol appears in the margin with a reference to appendix 1. These are very extensive and very useful. Rather than having pronunciation symbols within the text, there are 14 pages of words and a guide to pronunciation in the appendixes. This keeps the text clean and readable and still gives an easy to find pronunciation guide when you want it. 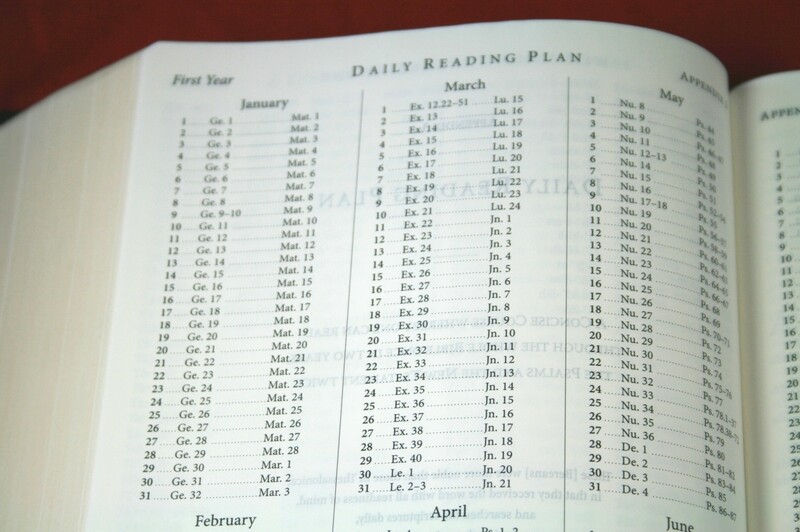 The reading plan will lead you through the whole Bible once, and the New Testament and Psalms twice in two years. 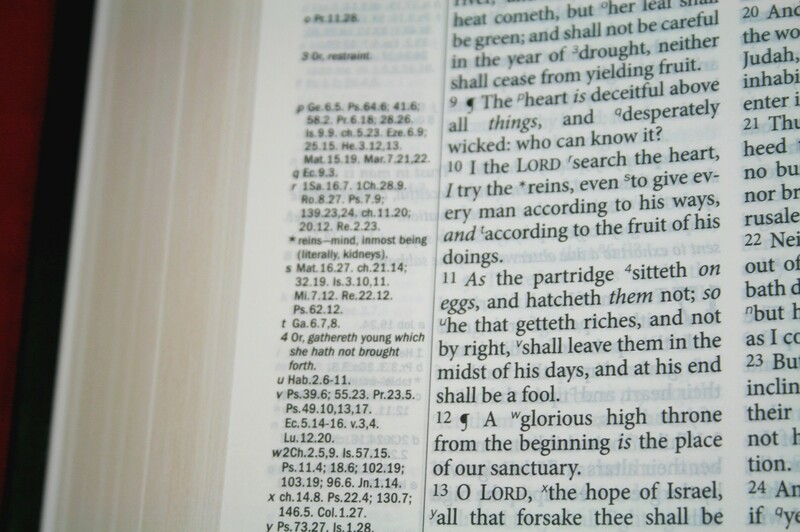 Each days’ reading includes the Old Testament and either Psalms or the New Testament. The concordance is 139 pages. 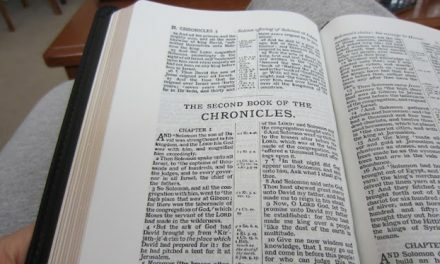 It looks a lot like the one found in the Concord, where the next verse appears on the same line as the precious verse rather than starting on a new line. I find this style of concordance difficult to use, but this style does allow more verses for less space. It has a lot of entries. It has over 50 entries for ‘God’. There are 8 full color maps on thick, non-glossy, paper. Some of the maps have arrows and annotations that look like modern presentation slides. I like it. I love the colors of the maps. They remind me of a Risk game board. One thing I would like to see added is an index to maps. I think that should be a standard in Bible publishing. 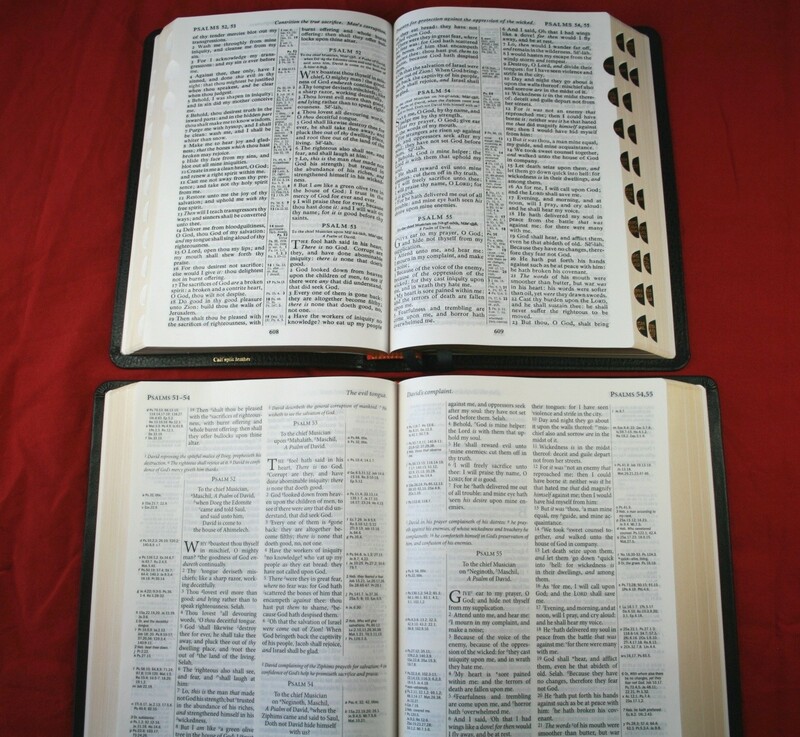 Here are a few comparisons to other Bibles. They are: Longprimer, Concord, Clarion, and Thompson (in that order). The philosophy behind the TBS Westminster Reference Bible is that Scripture should interpret Scripture, and the best study Bible would be a Bible that supported this train of thought. 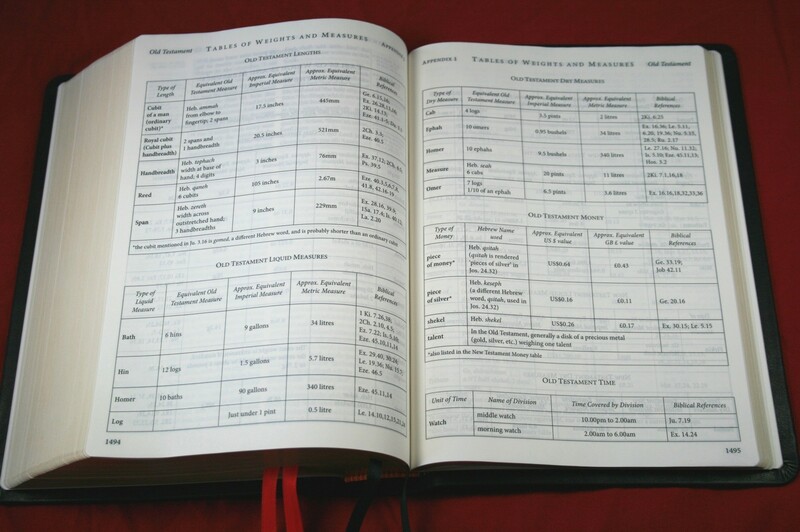 The 200,000 cross-references in the Westminster excel at allowing Scripture to interpret Scripture, making the TBS Westminster Reference Bible a top choice for a study Bible. TBS got it right. They’ve added what is needed and not added what is not needed. I would like to see a few additions, like an index to maps, but that’s a very small complaint and I wouldn’t use it that much anyway. Everything I need is here. The book size feels right, the text size feels right, the paper feels right, the price feels right, and the study tools are amazing. 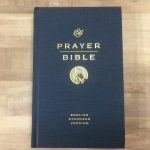 The TBS Westminster Reference Bible is my favorite KJV on the market today. TBS provided this Bible free for review. I was not required to give a positive review- only an honest review. My opinions are my own. Local Church Bible Publishers “Hand Size Text Center Column Reference – 110 Series”. Also known as the CCC. Any word if there will be a similar production for other translations of the Bible. 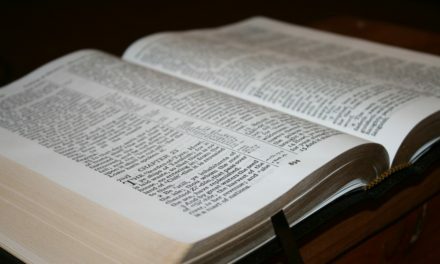 ESV, NAS or NKJV? Hi Mike. I don’t know of anything similar coming out any time soon. TBS only produces King James, but when something like this catches on other companies tend to follow suit. I suspect we’ll see some good Bibles produced in the next few years. Thanks for the great review. I had a copy but I let it go and I’ve regretted it, but I have been planning on ordering another. Translator’s notes? This is something I didn’t pick up on until recently and I’m glad you mentioned it. How in depth are the translators notes? And are you aware of other resources that includes the original KJV translator’s notes? I also overlooked the outdated words defined in the columns. Nice format and worth every penny, but I would love to see it in a bolder print. Schuyler’s version is due out soon but I’ve heard the paper is identical to the TBS. If we could only get LCBP to do a print run, can you imagine one in the Ironed Calfskin or Top Grain Cowhide and with the Note Taker’s paper? Just a hint. Hi norm. There are quite a few notes. Genesis chapter 1 has 13 notes. Most of the notes don’t really make much of a difference. They just give another rendering, or another way it could have been phrased. There are a few notes here and there that shed more light on the text. 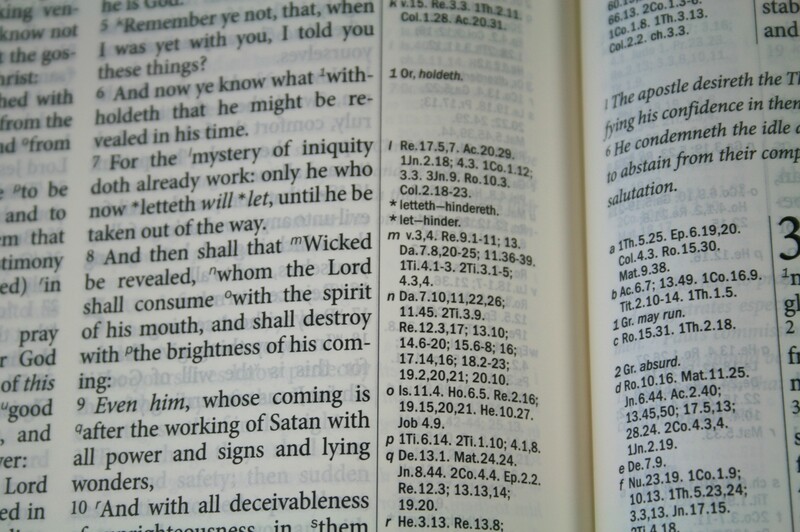 There are many other KJV’s with translator’s notes. They are common in Cambridge Bibles. I would love to see the Schyuler version. For the size, features, quality, and price, the TBS Westminster is hard to beat. I’m sure the binding on the Schuyler will be real nice, there is a photo of one in the firebrick red on EVB’s Facebook page. In regards to the TBS, the translators’ notes to me just prove there was some thought or discussion as you said to the different possible renderings/phrasing which in some cases can only be determined by understanding the content. I also recently purchased a copy of the Note Takers based off your review, which I will post a comment on that particular review page. Which editions from Cambridge do you prefer for reading or for study? Oh, by the way, GREAT photos. Hi Norm. Thanks! I can’t wait to hear your thoughts on the Note Taker’s. As far as my favorite Cambridge… I like them fore different purposes, so I have several favorites. The one I read from the most is the Concord. I like the size of the Bible and the text, and I like that it has references with notes, and a dictionary/encyclopedia in the back. I hold it in one hand and read with no trouble at all. For study, my favorite is the Concord Wide Margin. The wide margin is also my primary carry Bible, but I don’t mind large Bibles. For times when I need to carry a smaller Bible, I still go for the regular Concord. 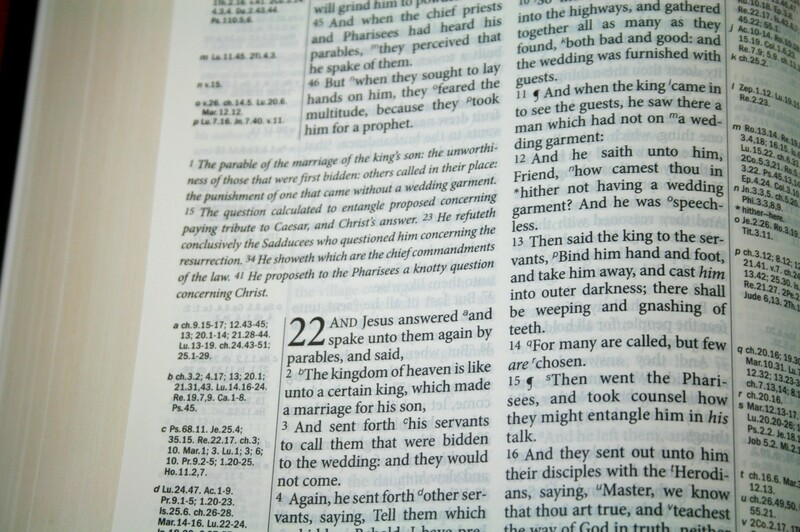 The Clarion is also a great Bible for reading and study. The text is not as bold as the Concord, and my house is a little dark, so the bolder font of the Concord is easier on my eyes. If I could only have one I would choose the wide margin, but that’s because I like marking in my Bible and it has the best paper for marking. The Note Taker’s is better for notes and reading, so I’ve been going back and forth between the two. I’ve been eyeing the Concord Reference for some time now as I also prefer the bold print, but is the print even throughout? The layout of the reference material in the back also looks impressive. Thanks for the information. Hi Norm. The print is very even throughout. It’s easier to read than larger print that’s not as bold. It’s available with or without red-letter. The red-letter is only for the words of Christ while on Earth. I received the Westminister Reference Bible from TBS today as well as a shipment of the 115 LCBP. I’ve left my comments about the 115 on the comments section elsewhere on this Blog. I really like the Westminister Reference Bible! 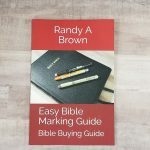 I don’t want to duplicate Randy’s review so I’ll just add some observations that I have made: The quality is excellent, printing binding, everything is just marvelous. The Calfskin cover is soft without being floppy, the texture, and feel of it is something one needs to experience himself. I can tell by the feel, the smell, and the texture, that it still has the natural leather oils, I won’t have to annoint this leather with a treatment necessary with most Bibles. 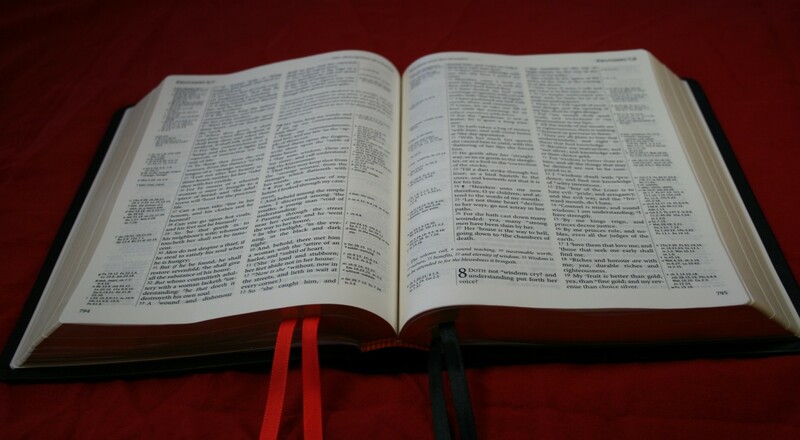 I found a small section in the front of the Bible about how to use the references and other helps, this should be read carefully to avoid learning by trial and error how to utilize all the help available. I too noticed the lack of a glossary, I would also like more maps with more detail. I am a student that took enough Geography classes in University many years ago to qualify for a second major, so it is only my particular interest in Geography that makes me want more maps and more detail, there are Bible Atlases out there for people like me. This may prove to be the end of my search for the Bible for me, I still want to try the Alan LP 52 with the French Morocco Binding though. This latest offering from TBS is outstanding, I’m really impressed. After using this Bible for a few months now, I think I can report on how it is working for me. 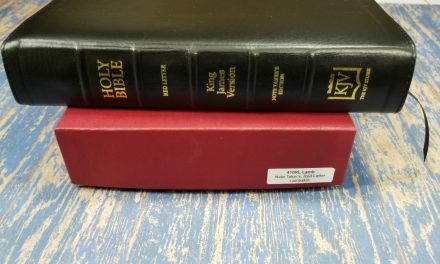 It has taken some time to get used to a larger format, but experience has taught me that this Bible will work as a reading as well as a reference Bible. Having been using a Cambridge Personal Concord in KJV, it has taken some work to become accustomed to this one. The type is large enough that it is easy to read in any reasonable light. I especially like the imbedded dictionary for Archaic words because I don’t have to stop and look up the word before continuing with my reading. The huge number of cross references and the other helps that Randy has covered in this review are excellent. I can find no real fault with this Bible at all. If I was having one built for me personally, I would want a detailed Index of Maps, and probably 10 more pages with maps on each side. I know most don’t pay a lot of attention to Geography in general and this is not an Atlas. 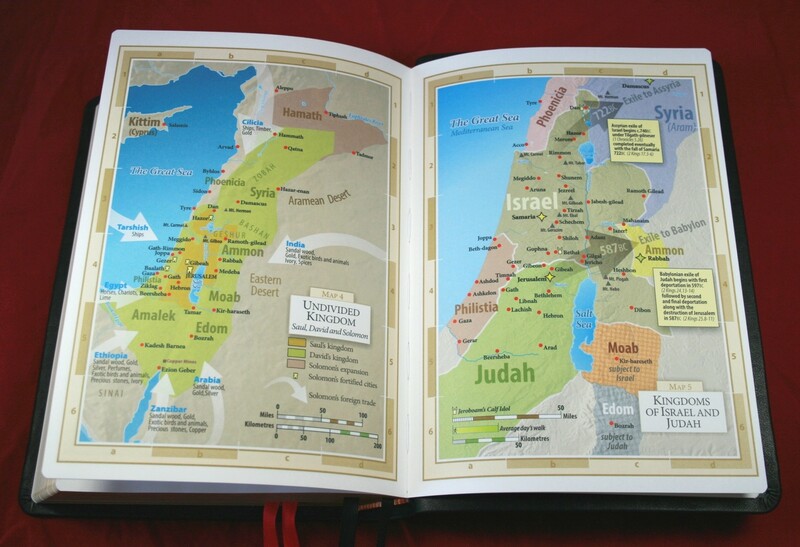 There are a few excellent Atlases out there for folks like me, what maps are furnished in this Bible are excellent and sufficient for most anyone. My personal Concord still sits on my lamp stand by my recliner, but the Westminister is also there and is getting more and more use as I get accustomed to it. This is a great edition of the Bible, it may even become my carry Bible. An excellent bible. The text block is outstanding. There is absolutely no gutter cockling. Great paper with minimal ghosting. The text is aligned parallel and square to the edges with no visual evidence of being canted or off angle trimming. The text font seems identical, or almost completely so, to Linotype Minion after examining all the regular and italic characters and question and paragraph marks. The print density is uniform throughout and so far have noticed no broken characters. Trivially it may seem, it is remarkable how sharp the font character outlines are when examined through a high power loupe compared to the LCBP Cameo #115 or Allan Brevier Clarendon style text in their current printings. One thing I have noticed in this as well as TBS’s Windsor is that you have to be careful how you open the bible. 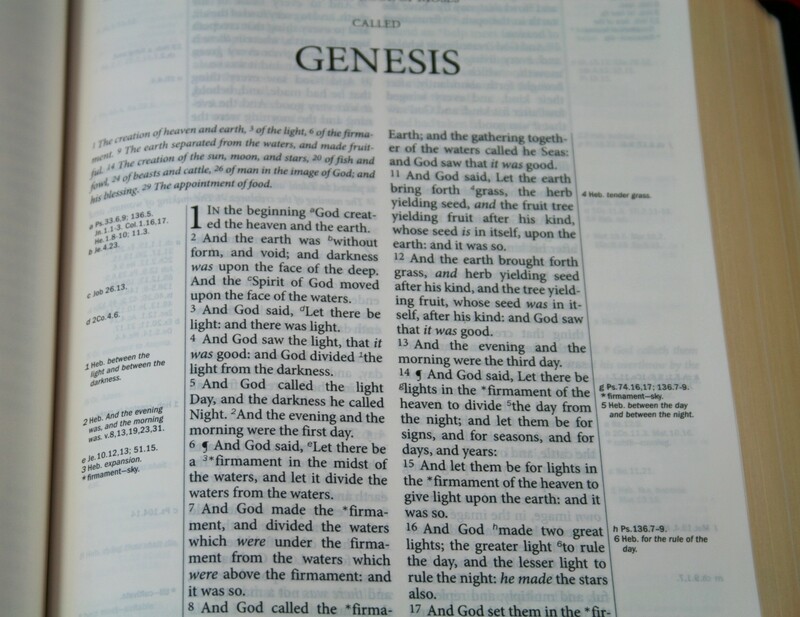 There is a tendency for the first bible paper page to slip downward and the weight of the rest of the pages to cause it to be creased when subsequently the bible is held or laid down horizontal. Another minor issue is some of the ribbons exit the spine on an angle or are squeezed in width somewhat at that point. The first Westminster owned was free of any stuck together pages. The second two had a considerable number of pages stuck together, perhaps roughly 40%, for a length of up to 2 to 3 inches. 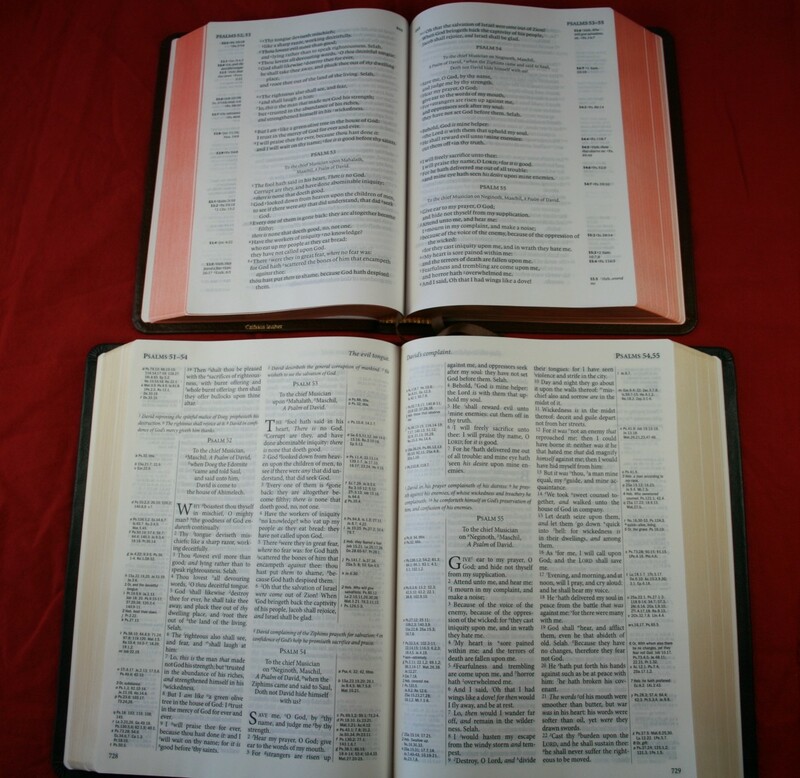 It was necessary to check every page of each bible and separate as required. Must have spent a couple hours or so on each. The attachment of the cover to the text block is by the paste off method. If one likes the font type and layout, I think they will find this a highly desirable edition of the King James Version. The printing of the Westminster text block is impeccable in its workmanship. While a personal thing, still find the “Cameo” style bibles have a certain coziness or warmth to their layout for reading, more so than the Westminster. All the other good things have previously been noted by others. I too have noticed the tendency of pages to get folded and creased unless care is taken to prevent it in this bible. Unfortunately this is common to every large bible I have handled. I have to take the same care with my LCBP Thompson Chain Reference, and in every large format bible I have observed over the years. It probably has something to do with the battle all publishers fight trying to get a large amount of information in a package that is small enough to handle reasonably well. I am considering getting my LCBP Thompson Chain Reference re-bound in something a little more substantial so that I can use it comfortably away from a desk or table. 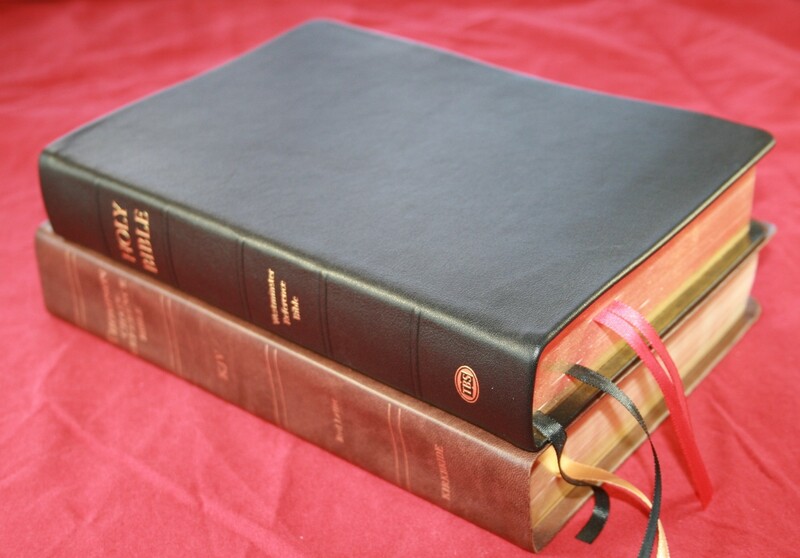 When using this bible, the Westminister, and other large bibles seated in a chair, recliner or a pew, I get fatigued after a few minutes, and always worry about damage to the lower edges of the pages, cover, and to the ribbons. Probably a hardcover is most practical, but I, like almost everyone else enjoy a nice leather binding. I am learning to adjust to the size of the Westminister for seated reading, and find the cover to be a reasonable compromise in flexibility and support, I’ll probably have the ribbons replaced with wider and more substantial ones though at some point. You have made some very well considered observations regarding workmanship on this bible, I don’t know how much it will affect its use or my pleasure in reading it though. I myself have found the format and printing to provide good reading and more than adequate references that are clear and easy to use. The details you have documented are good to know. 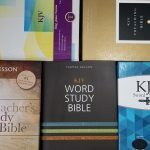 I have purchased several of the TBS Westminister bibles now, one for myself, and three for gifts, I must have been lucky, I found only about 5-6 pages stuck together in all of these combined. This condition is not unusual though, I have seen a blble with almost all of the pages stuck together by the gilding process. We were able to separate every page with no damage, but it is frustrating isn’t it? 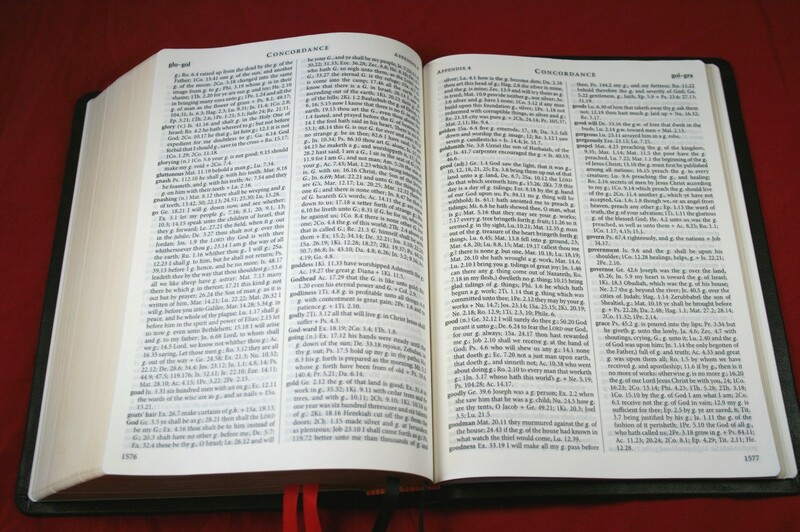 For a preacher, who loves to make his own notes but also wants some good helps, what would be your suggestion for a KJV bible? I have looked into TBS-Westminster, LCBP Take Note 400 Series, Allen Oxford Clarendon Wide Margin, Thompson Chain-reference, & Cambridge Concord Wide Margin but I cannot decide what is the best choice. Should I go with one of these I have looked into or is there another bible you think I should consider. I am looking for a bible that will aid me in the long run. One that is comfortable to carry but still has some space to write and some useful helps but not an overbearing amount. What would you suggest? Well, I am an avid note taker, but I love cross references, basic helps ( ex. Harmony of the gospels, book introductions, bible dictionaries)and good maps buy I don’t know if I want all those extras the Thompson-chain uses even though they are nice. I also like bibles with note pages in the back. I use 81/2×11 label sheets and print off charts to put in the endsheets of bibles so I like lots of end sheets as well. If you had to pick one what would you use? I currently carry one of two Bibles. The first is the Concord Wide Margin and the second is the regular Concord. The only thing I like better about the regular Concord is that it has a dictionary (and it’s easier to carry). The wide margin has blank paper instead. Other than that they have the same contents. The paper in the wide margin is much better for marking and the regular is much better for holding in one hand to read. One thing I love about both of them is the text is bolder than the Thompson and much easier to read. I wish the font was at least a 9 point instead of an 8. The regular Concord has all those helps you mentioned and the wide margin has the writing space. If we could get the wide margin with the dictionary it would be the best choice. I love the Allan wide margin but it doesn’t have a concordance. It has chapter summaries, which are nice (but I don’t agree with all of them). The only other Bible that comes to mind that has those features and writing space is the Keyword study Bible. 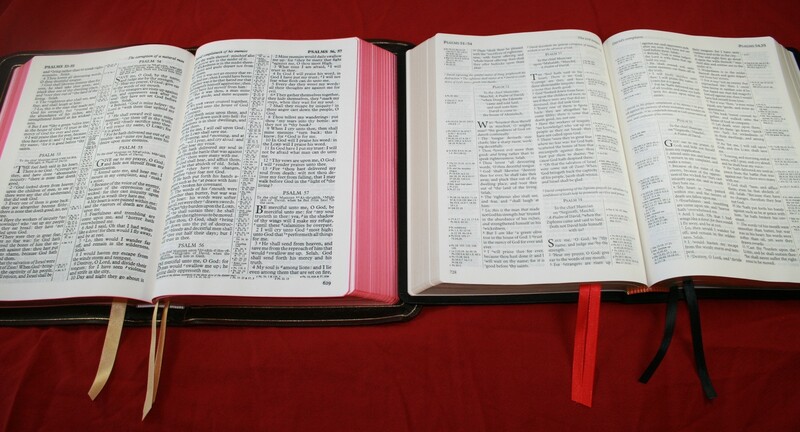 This really is a hard choice because it’s difficult to find all the features you want in just one Bible. Another one I like is the Longprimer. It has a references with notes, topical index, concordance, maps, and writing paper in the back. It doesn’t have the harmony of the Gospels and there’s no writing space except for the 32 pages in the back. It is a Cambridge Cameo with 8-point font, concordance, references, and maps, with an inch margin on the outside. I haven’t seen this one yet but I’ve heard good things about it. Blake Ratliff reviewed it. I carry the regular Concord the most right now. I usually don’t like my own handwriting in my Bible and if I haven’t written enough in it then it won’t be that helpful. I decided that the dictionary was more valuable to me until I get my notes in the wide margin. Those are my two favorites. My next favorite is the Westminster. It doesn’t have the helps you want, but I like the 200,000 references and definitions in the margin. It has paper in the back for writing. There is a little room on some pages between the references, but not much. If I could only have one… I wouldn’t be able to choose. I like the dictionary in the Concord and I like the writing space in the Concord wide margin. I think I will go with the Cambridge then if that is the best choice for me. Thank you! Good choice. Please let me know how it works out for you. I just received my TBS Westminster this morning. After my critical examination I agree with all the positive comments I read on this site. The cover is a bit stiff but that has advantages in use as far as I am concerned. No stuck together pages were found. I really like this Bible. The font size and boldness is easy to read but I don’t find it quite up to the easy readability of the Cambridge Concord. Saying that I do not mean it is not very, very nice, because it is. With the color and feel of the paper and the crispness and boldness this is a beauty. I must offer this comment. In all the advertising on various sites, in the reviews and specs, a big deal is made out of having over 200,000 cross references, and this includes Schuyler’s site. Well, I hate to be the one to say this, but mine says on the box “More than 80,000 references”. Now…I have not actually counted them to see which figure is correct but I did call evangelicalBible to ask about it. The person checked whatever he had from TBS and could find nothing to address the discrepancy. He said he would contact TBS and let me know what he finds. This discrepancy is not a deal breaker for me but it seems to me something that should be addressed. Hi Lee. I’m glad you like the Westminster. In my opinion it’s one of the finest KJV’s available. I should have mentioned about the number of cross references. It does have 200,000. The 80,000 is a misprint. The references are a combination of John Brown’s Self Interpreting Bible and the references from the Cambridge Concord. I think the Concord has 80,000 and that’s where the number comes from. Hi Brian. The TBS edition doesn’t have the leather lining like LCBP or Allan. It’s more like the French Morocco or Calf Split Concord, or Pitt Minion which has a vinyl liner with tape. The Schuyler edition has the edge-lining like LCBP and Allan. My wife has used the TBS edition since we first got it and it hasn’t shown any signs of problems. She goes through Bibles quick. It has lasted the longest so far (for her). Overall, the Schuyler is built much better and will last longer. The TBS is an excellent deal since they have the same text block. I’ll add some pictures of the liner when I get a chance. Thanks so much for your time in replying. I think I am going to take the plunge on this one. LCBP has really been a draw for me, but they don’t have a reference style right now. I forgot about the picture :0( I’ll try to add it tomorrow. I’ve wanted a good reference Bible from LCBP but they just don’t have one in a large enough print. Their Cameo edition is the best choice, but it’s only an 8-point font and the text is crowded. I love the text and paper of the Westminster. It’s better than anything from LCBP (and I’m a LCBP fan). The font is sharp and the paper has a gorgeous cream tint. If it was the only Bible I could ever have I would be happy with it. Good choice. I got mine yesterday. It is beautiful. I preached from it today, with no problems. Thanks again for your detailed photos and description. There are accurate to the real thing! Sorry to post twice about receipt. Had some difficult with computer. No problem. I’m glad you like it. We were reading in 2 Timothy in church today and we came across the word ‘incontinent’. 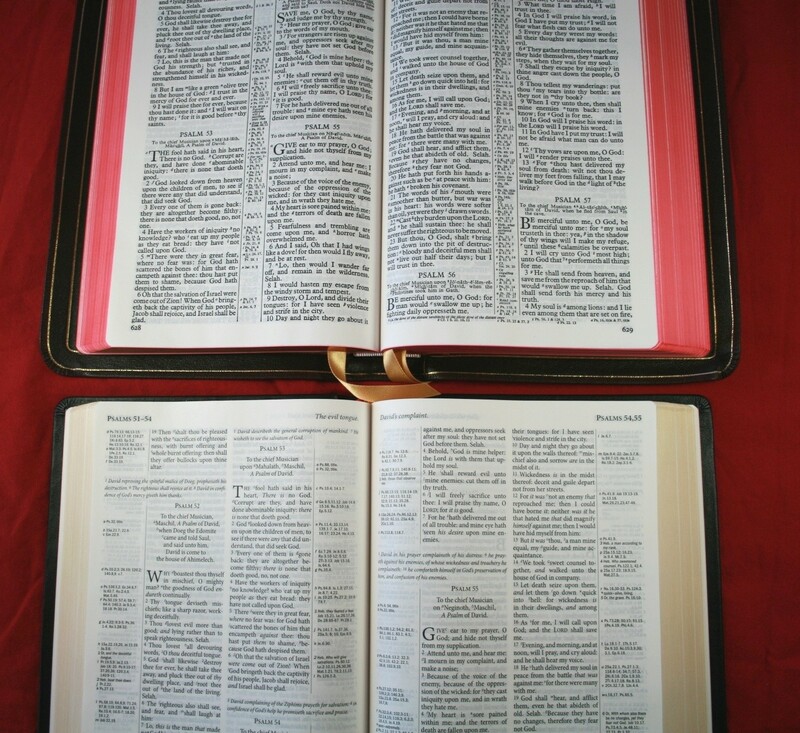 I had my Concord (with its dictionary in the back) and my wife had her Westminster (the only Bible she claimed before I had a chance to see it. I decided that letting her keep it was a good idea). Someone asked what the word meant. She read the definition in the margin. I looked in my dictionary… but it wasn’t there. When I got home I looked in my Dugan Topical Reference (with its 300 page dictionary). Nothing. Of course I could have looked it up on my phone, but in the Westminster it was right there in the margin where we needed it. The Westminster wins! Well, the story continues! Just last night I was gifted with an Allan Longprimer in Black goatskin! (Brand new in the wrapper, same model as the brown In your pictures). I confess I looked at the Allans while researching, but could never allocate that much money. Now I have the Westminster AND an Allan. Wow! Nice! How do you like it? Which do you like best? A single flaw. The print is not as bold as the TBS Concord. For that reason alone I prefer the Concord (and Longprimer). Hi Paul. A bolder text would be better. I carry the Concord and my wife carries the Westminster. I’m always comparing the two and that’s the one point I keep coming back to. The Concord (and the Longprimer) is still easier to read. Randy, in comparing the two, the craftsmanship of the Allan is amazing. I certainly give it the edge in that area. I like the modern font of the Westminster. It is spaced better. I do like the reference system in the Westminster. For a “reader” Bible, the Allan is hard to beat. If you want the helps, the Westminster is very very nice. So, I guess the compromise is the new Schuyler Westminster combining quality with text block. Hi Brian. I’ve come to the same conclusion. I really don’t think either one is a bad choice. They’re both great, but for different reasons and uses. THanks for the follow-up. Hi Butch. They used the chapter summaries from Eyre and Strahan. Those original chapter summaries from E&S used words that were not found in the text. TBS took those chapter summaries and replaced those words with words that were found in the text. So the Westminster’s chapter summaries are better than the ones from E&S that they’re based on. Of course being better doesn’t mean that they’re completely correct. I’m sure if we looked close we would find things we disagreed with in the chapter summaries, just like section headings in a study Bible. Thanks again brother your review is spot on making it very easy to order a bible online. 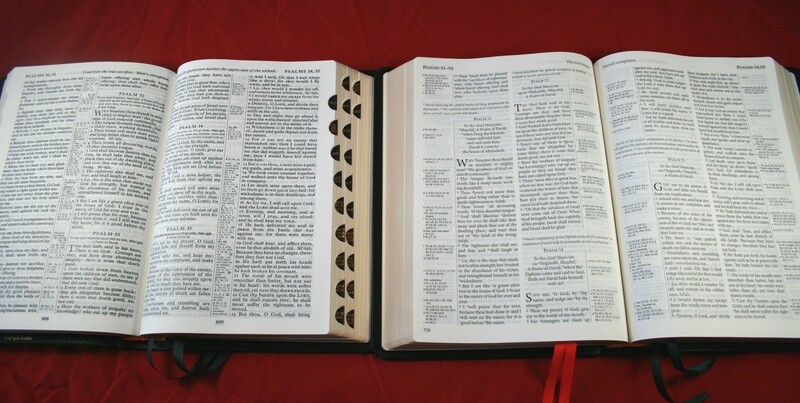 One of the most difficult issues when purchasing bibles today is not being able to hold them and flip through the pages to make a decision. Gone are the days of going to your local bible store and being able to pick out something that’s very personal. Your reviews have blessed me personally, thankyou for taking time out of your life that we may open our new bibles without worry. I appreciate you taking to time to let me know. I would love to open a physical store one day where people can actually touch and see the Bibles for themselves. It’s impossible to really describe the look and feel accurately enough. I don’t even try to describe the smell of leather! I just ordered this Bible yesterday. I’m stoked to receive it in a few days. I was curious, has there been any problems with ink “smudging”? I had a couple of LCBP bibles and that was a big problem I had with them. When I minister and study I tend to run references and hold particular places with my fingers. 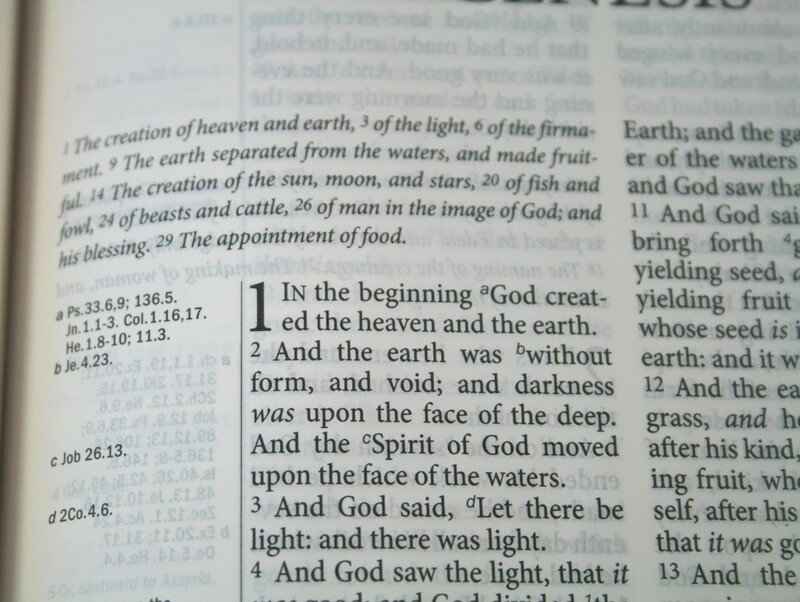 With my LCBP Bibles, I guess the oil on my fingers would really mess with the ink on a couple of occasions. Any problems like that with the TBS Westminster? I’ve had no problems with smudging. The paper is a lot different that what you find in LCBP. The Westminster has the Jongbloed paper that you find in high-end Bibles. It’s my favorite paper. Thanks you for your quick response. That’s great to hear. Do you know how it does with writing, underlining, etc.? Any bleeding? I haven’t written in it yet. If I do try it I will let you know. It’s really no big deal for me. I don’t write in my Bibles much anyways. I was just curious. Appreciate all your help man. Your review and answers have me even more stoked about getting the Bible in the mail here soon. I just got mine late this week from Evangelical Bible. I feel like I should send TBS a contribution- they definitely have underpriced this Bible, and I got a discount to boot from EB! I would agree with your review based on my initial examination. The paper is a touch thinner than I would prefer and I would put up with a slightly thicker Bible as a trade-off. 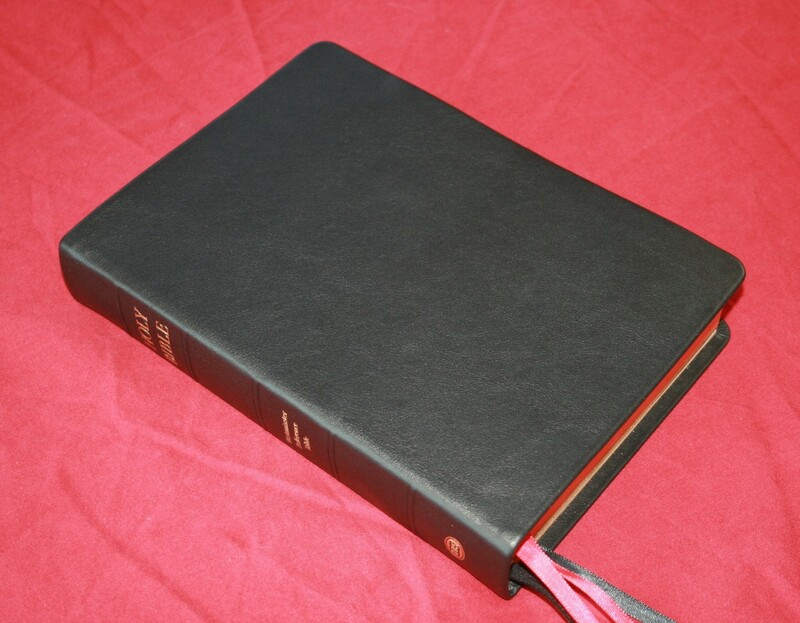 I do not own any goatskin Bibles, but the cover is probably not as stiff as other leather Bibles I own. Those personal preferences aside, I am more than pleased with my purchase. The system of references is a mix of the familiar (Concord) and unfamiliar, but they are readable and reasonably intuitive. I particularly like that the Translators Note to the Reader is included- that is an interesting document in its own right and we’ll repays close study. BTw, Evangelical Bibles web page still shows this as being backordered until July, but I put my order in around Memorial Day, so I suspect they now have them in. 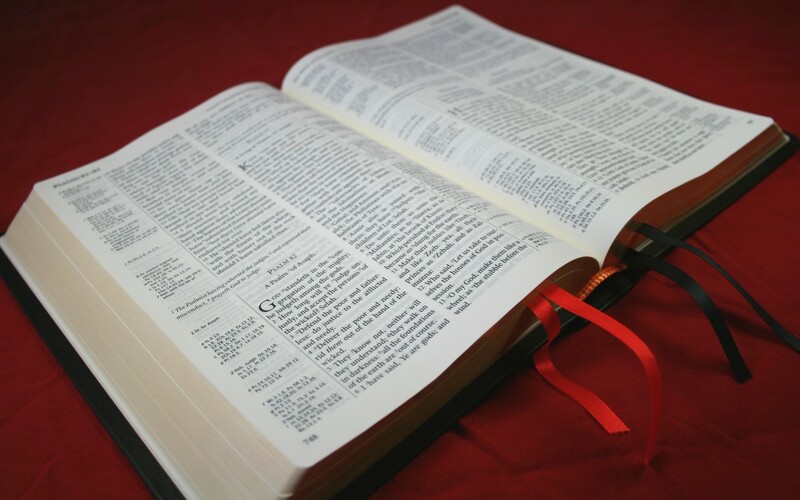 Years ago purchasing a quality Bible was not easy, no internet and few Christian book stores that carried quality Bible. My first early in my Ministry was a Thompson Chain reference. Great Bible for my desk but not so when out today ministering the the hospital and Jail. 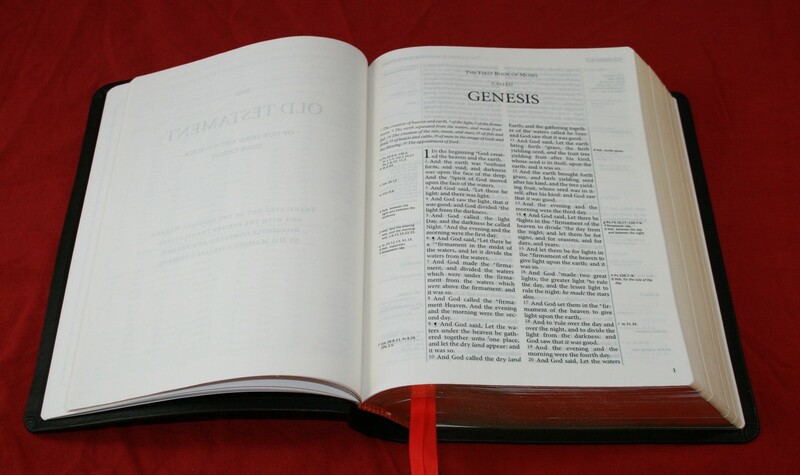 I have had many other Bible of varing quality and though I do not need a new one, I decided to purchase the highest quality regardless of price. After many days doing research on line I was glad to finally find the Westminster. It offer some of the same high quality things as some other costing $100-200, and at $65, an amazing price. Mine is still coming, but my post is to thank you for your review it helped to make my final decision. Thanks Jeff. I’m sure you’ll love the Westminster. It’s one of my all-time favorites. I also highly recommend the compact edition. Could you please tell me the actual size of this bible. Hi Chris. The block size (the size that publishers give) is 8.5 x 5 7/8 x 1 3/8″. The size including the cover is 8 15/16 x 6 1/4 x 1 1/2″. 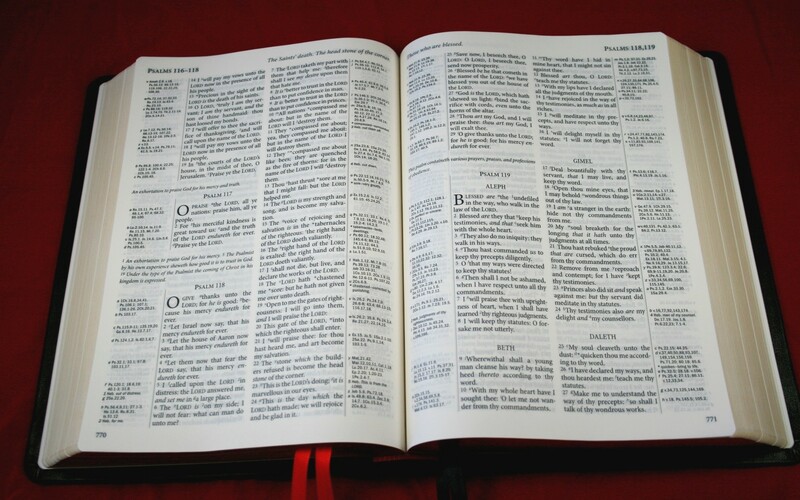 Wanted to know the overall size of this bible? SORRY DIDNT MEAN TO POST THIS TWICE!! Randy, your statement concerning the status of the obsolete words, regarding the Westminster reference bible (KJV) in calfskin is somewhat imperceptible. Are obsolete words in the text replaced betimes with modern English equivalents, or not. Could you be more specific. Cordially, M. D. Myers. Isa. 54/17. Hi Micheal. They are not replaced. They are noted with an asterisk and the updated word is placed in the margin. Assume you’re going to use this (now mid-sized) Westminster, by disbanding it and putting each page in an A5 clear-glass punched pocket, so as to create the basis of your own interleaved edition, would you 1. keep the concordance or replace it with another (A5, and which? ); 2. add the [Open Bible] Cyclopedic Biblical Index – now available as a standalone product (isbn 9781418543747) or similar (which? ); 3. Add an/ other item/s (which?)? In other words, what are your ideas for your own interleaved or looseleaf Bible, A5 size, using the Westminster as the base? 1. I’d be ok keeping this concordance. If I did replace it, it would be with a Cruden’s (possibly the one from Local Church Bible Publishers). 2. Adding a topical index would be a great idea. I’d either add the one from the Open Bible or the old Oxford cyclopedic index that’s used in the Scofield or Allan editions. I’d probably use whichever is easiest to get and fit. 3. The dictionary form the Concord is the first thing that comes to mind, but I’d have to put some thought into this one.
! I’m on the point of putting together some formats for an A5 product, so I welcome good ideas! In these days of not having what the men of the nineteenth century (who wanted to improve the AV/KJV, but slowly and cautiously) called ” our common version”, and with modern technology, we can make our own Bibles – for better and for worse! There is an inexpensive standalone A5 (or just smaller) size Nelson’s Cyclopedic Biblical Indes available, isbn 9781418543747; and I’m going to grab two or three while I can!